London is renowned for its culinary delights, from Michelin-starred restaurants to quintessential British gastropubs. However, Britain is perhaps most well known in the culinary world for its traditional English afternoon tea and there are plenty of spots throughout the capital to indulge in this luxurious pastime. This hotel is practically synonymous with afternoon tea, with Queen Victoria taking tea at Brown’s during her reign, and offers a traditional taste of the English pastime. With a choice of over 17 teas and a selection of sandwiches, scones, cakes and pastries, ranging from a coronation chicken, yoghurt, apricot and onion bagel to a chocolate and banana gateau, there’s something for everyone. Plus, the Tea-Tox afternoon tea offers a delicious low-carb alternative! This fine British institution is host to another traditional offering, complemented by a musical ensemble from the resident pianist and harpist. The Ritz is the only hotel in the UK to have a certified Tea Sommelier, which ensures that the 18 different loose-leaf teas are perfectly suited to the delicate menu. You can also opt for a glass of bubbly to enjoy with your food, with the menu highlights including the Scottish salmon and lemon butter sandwich and delightful scones. Pimms o’clock at Claridge’s today as we prepare for first service of Wimbledon afternoon tea #gamesetandmatch #newballsplease #etonmesschocolateballs #teatime #pimms #claridges ?????? This traditional afternoon tea encompasses all of the best things about this English institution, served in an elegant setting. Perfected over 150 years of service, you’ll find a choice of 24 teas, as well as a menu of sandwiches, pastries and scones designed by Executive Chef, Martyn Neil. From a duck egg sandwich to a raisin scone and chestnut and vanilla éclair, this experience is magical throughout. Served in the prestigious Palm Court, The Langham has been serving afternoon tea to London society since the Victorian era and is often cited as the birthplace of this tradition. 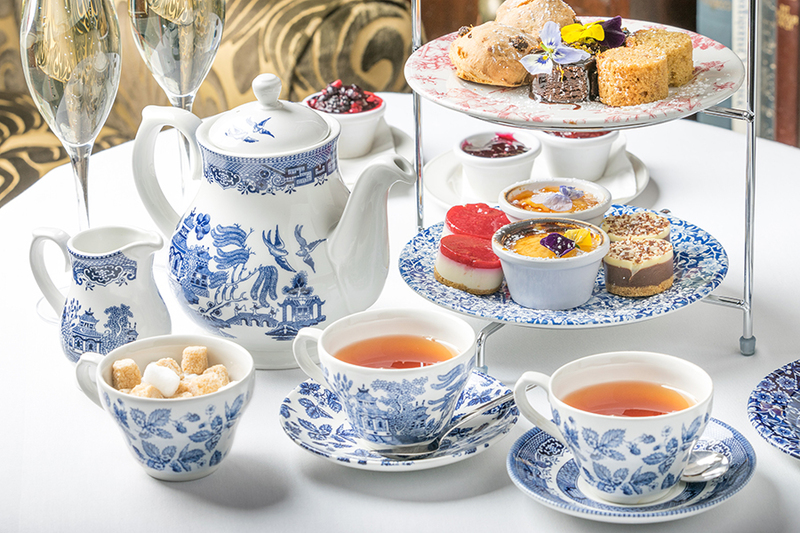 With a selection of 30 tea blends, a beautiful menu and all served with tailor-made ‘Langham Rose’ Wedgwood teaware, this luxurious experience is ideal for those wanting a traditional taste of Britain, with menu highlights including a classic cucumber sandwich and delicious Parisian patisserie. This afternoon tea is the ideal experience for those wanting a traditional menu with a decidedly unique twist. Set in a room full of humour, art and curiosities, this menu is full of unusual flavours to excite your taste buds, from a quail egg sandwich to a liquorice marshmallow petit gateau. Plus, you can also have your choice of cake served from the trolley, with an option of a traditional Victoria sponge or a banana fudge cake. Taken in the iconic Diamond Jubilee Tea Salon in Fortnum and Mason’s Piccadilly store, this quintessential afternoon tea is elegant and refined. Those who opt for the sweet menu can enjoy traditional finger sandwiches along with delicious scones and a selection of individual pastries and cakes, whilst those who opt for the savoury option can enjoy finger sandwiches, savoury scones and luxurious canapés, with both options offering the choice between Fortnum’s famous blends or rare tea. This izakaya-style restaurant serves casual yet refined Japanese cuisine, delivering an afternoon tea menu with an Asian twist. With the choice between five traditional Japanese teas, you’re also treated to sushi-style temaki bites, including tuna, salmon and winter vegetables. For the sweet side of things, expect traditional patisserie fused with Oriental flavours, including a Japanese cotton cheesecake and a chocolate sesame praline petit gateau. This restaurant offers superb views over London from the height of the Shard, providing the perfect backdrop to your afternoon tea experience. Guests enjoy the choice between two different menus: a classically English fare or an Asian-inspired alternative, all complemented by your choice of tea from over 30 different blends. At the time of writing, the Chinese New Year menu offered classic scones alongside pastries such as the Chinese Lantern and Year of the Dog Macaron. Located on the sophisticated Regent Street, this hotel has been the meeting place for London’s greats for over a hundred years. Featuring a modern twist on traditional British treats, this award-winning masterpiece is enjoyed in the historic Oscar Wilde Bar and Domino room and is inspired by the popular scents of French perfumer Diptyque. The menu features classic sandwiches such as smoked salmon, as well as quintessential delicacies such as a quince and yoghurt tart. Our Wyld Tea is in the process of a new chapter, so if the Pine Scented Basked Alaska & Berries and Nutmeg Custard Tart are your favourites, then here's your perfect chance to book in for another Wyld afternoon in @dandelyanbar ???? The Wyld afternoon tea offered by the Mondrian is taken in Dandelyan, an award-winning cocktail bar, and offers a retro take on the classic menu. Inspired by the 1970s and with a botanical twist, this afternoon tea comprises of four courses, each with a unique take on the tradition. You’ll enjoy specially crafted cocktails (although there are alcohol-free options), as well as a choice of tea and nostalgic flavours including a refined ham hock sandwich and elegant Battenberg cake. This modern take on the classic menu has been voted as the Best Contemporary Afternoon Tea in the UK, being inspired by London’s vibrant art scene. Featuring designs based on five iconic artists, including Banksy and Damien Hirst, these sleek and sophisticated bites have been painstakingly created. Jeff Koons has inspired a chestnut cream and almond sponge, whilst Jackson Pollock’s art has created a delicious cherry brownie, all enjoyed alongside flavoursome traditional sandwiches. Served in The Rosebery Lounge, this traditional afternoon tea expertly combines quintessential British flavours with subtle Asian twists. With a choice of over 40 different tea blends, including some rare and limited teas, you can enjoy classic finger sandwiches of smoked salmon, crab, and chicken, alongside some more unique flavours. The homemade pastries, however, steal the day, with highlights including a Mandarin mont blanc and maple syrup and pear jam ball. This unique and quirky afternoon tea is served in either of the two hotels, one located in Marylebone and the other Clerkenwell. Based around the fictional Aunt Wilhelmina’s finger sandwiches and Uncle Seymour’s hearty treats, highlights include a pasty, a truffled sausage roll, and a mini croque monsieur, alongside a delicious spiced gingerbread cake and a Bailey’s chocolate Rocher. This quirky theme is followed throughout the hotels, including the décor. This Nordic restaurant offers a Scandinavian take on the traditional afternoon tea, incorporating the Swedish tradition of ‘fika’, or a mid-afternoon coffee and pastry. The menu includes a selection of smørrebrød, or an open sandwich, with fillings including gravlax tartare, shrimp skagen, celeriac and lovage and beef tartare. Next comes the fika trolley, with a selection of classic Swedish cakes and punsch rolls, including a cinnamon bun, cardamom bun and an almond tart, all of which can be enjoyed with tea or coffee. Found by passing through a subtle black door next to the Marriott hotel in Grosvenor Square, this menu combines both its English and American Speakeasy heritage. Taking the original name of ‘low tea’ rather than ‘afternoon tea’, this experience goes back to the beginning of the tradition, featuring a comfortable and relaxed atmosphere rather than the stuffiness of modern teas. The menu features devilled Balmoral venison and hot wild boar sausage rolls, as well as a jam jar trifle. Located virtually next door to some of the best museums in London, this elegant hotel in South Kensington has taken inspiration from these cultural icons. The Science afternoon tea is based on both the Science Museum and the Natural History Museum, featuring a prosecco mint jelly, kiwi, lime & pineapple jam petri dish, a chocolate spaceman, a mini dinosaur biscuit and milk chocolate fossil, as well as some delicious savoury selections. This informal yet refined cafe is the perfect location to enjoy a traditional afternoon tea with a twist from the head chef, Anna Hansen. Based on the Modern Pantry’s philosophy of exciting the palate with modern and innovative ingredients, the menu features lots of superb and unique flavours. From the roast pumpkin, apricot and caicotta fritters to the basil, black pepper, blackberry and clotted cream scone, you’ll leave viewing food in a whole new light. Perhaps the finest institution serving afternoon tea in London, The Georgian is practically synonymous with this British tradition. Having opened in 1913 and named after the newly crowned King George V, the restaurant soon became a popular sport for taking an afternoon tea before promenading around Hyde Park. Today, you can enjoy a selection of finger sandwiches, tea pastries, scones and the famous Harrods’ Trifle in modern art-deco surroundings. The award-winning afternoon tea served at The Winter Garden is a treat for all, located in the heart of the eight-storey glass roof atrium. The traditional menu offers classic finger sandwiches, including coronation chicken and egg mayonnaise, as well as freshly baked scones with clotted cream and delicious pastries such as a macaroon and milk chocolate sponge. For a real treat, however, opt for the chocolate afternoon tea, which is perfect for chocoholics. This legendary afternoon tea is inspired by the world of fashion and designers and is aptly named the Prêt-à-Portea. Featuring a menu of cakes that gets a makeover every six months to reflect the latest catwalk designs, trends and colours, you’ll be treated to miniature savoury skewers, taster spoons, elegant canapés and tea sandwiches, alongside a selection of loose leaf tea, all masterfully crafted by head pastry chef, Mourad Khiat.